We’d love your help. 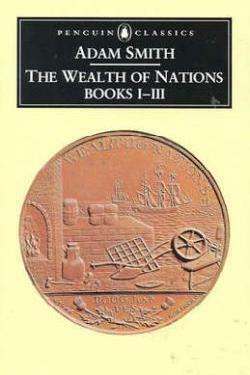 Let us know what’s wrong with this preview of The Wealth of Nations, Books 1-3 by Adam Smith. Originally delivered in the form of lectures at Glasgow, Adam Smith's The Wealth of Nations Books I-III laid the foundations of economic theory in general and 'classical' economics in particular, and this Penguin Classics edition is edited with an introduction and notes by Andrew Skinner. The publication of The Wealth of Nations in 1776 coincided with America's Declaration Originally delivered in the form of lectures at Glasgow, Adam Smith's The Wealth of Nations Books I-III laid the foundations of economic theory in general and 'classical' economics in particular, and this Penguin Classics edition is edited with an introduction and notes by Andrew Skinner. The publication of The Wealth of Nations in 1776 coincided with America's Declaration of Independence, and with this landmark treatise on political economy, Adam Smith paved the way for modern capitalism, arguing that a truly free market - fired by competition yet guided as if by an 'invisible hand' to ensure justice and equality - was the engine of a fair and productive society. Books I - III of The Wealth of Nations examine the 'division of labour' as the key to economic growth, by ensuring the interdependence of individuals within society. They also cover the origins of money and the importance of wages, profit, rent and stocks; but the real sophistication of his analysis derives from the fact that it encompasses a combination of ethics, philosophy and history to create a vast panorama of society. To ask other readers questions about The Wealth of Nations, Books 1-3, please sign up. "The Wealth of Nations" by Adam Smith is a collection of three books on different subjects in economic theory, marketing philosophy and economics. All of these books contain numerous subjects. The first book is titled "Of the Causes of Improvement in the productive Powers of Labour". This book talks about the division of labor and how certain professions buy and sell more and have a greater output in a market. This book also talks about the importance of stock and wages in a company. The second "The Wealth of Nations" by Adam Smith is a collection of three books on different subjects in economic theory, marketing philosophy and economics. All of these books contain numerous subjects. The first book is titled "Of the Causes of Improvement in the productive Powers of Labour". This book talks about the division of labor and how certain professions buy and sell more and have a greater output in a market. This book also talks about the importance of stock and wages in a company. The second book is titled "Of the Nature, Accumulation, and Employment of Stock". This talks about stock accumulation and interest. The third and final book is titled " Of the different Progress of Opulence in different Nations". This book describes the importance of markets in growing infrastructure of a nation. There are no main characters in this book. It is a compilation of multiple theories and writings, written by Adam Smith and other famous economist at the time. The settings takes place in England and Scotland during the Scottish Enlightenment in 1776. This was a time of great economic growth throughout Britannia. Smith also compares the economy of England to countries such as France and Brussels during the same time period. Smith's theme is that good markets and trade, lead to a greater world and a better growing nations. This is evident by his comparisons of the Scottish and English people and their standard of living. The Wealth of Nations is not an easy read, but it is the best, most truthful look at industrial and geopolitical finance, capitalism and free-market functionality ever written. If you have ever wondered why something that occurs in some far off land can have an economic impact felt round the world, then the answer can be found in this book. Smith's "unseen hand" was, apparently, mentioned only once in The Wealth of Nations, but the essential notion is implicit throughout the book. We are self-interested beings at our core, Smith argues. In an economic exchange, benefit comes not from benefice - good-hearted concern for others - but, rather, from the desire for mutual gain. Spontaneous order results from each seeking their own value. Self-interest, promoted this way and magnified to a nation-scale, promotes the interest of the whole Smith's "unseen hand" was, apparently, mentioned only once in The Wealth of Nations, but the essential notion is implicit throughout the book. We are self-interested beings at our core, Smith argues. In an economic exchange, benefit comes not from benefice - good-hearted concern for others - but, rather, from the desire for mutual gain. Spontaneous order results from each seeking their own value. Self-interest, promoted this way and magnified to a nation-scale, promotes the interest of the whole and, collectively, the wealth of nations. For Smith, the countervailing theory is the mercantile system that advocated national self-interest in the international trading market. The mercantile approach is to sell more abroad than what is returned in value. The key to national wealth is to promote the country's interest in trading at the expense of other countries. The balance of trade, in other words, is to benefit one country's interest and this, in turn, sets up a win-lose trading arrangement. Smith's rests his economic theory on his theory of moral sentiments. We are by nature social beings and this carries with it a certain disposition to cooperate for mutual advantage so that everyone's self-interest is satisfied. But Smith makes the mistake of presuming that humans all have the same nature whereas self-interested survival impulses work either by incorporating the interest of the other to protect the good of the other and the nation, or by seeking personal advantage at the expense of other other or the nation. This "other side" to human nature presents the problem that Smith encounters with a mercantile system. This seamy side to the market place is seen also in two forms of utilitarianism where some forces exhibit mutual benefit (utility) whereas other forms of cooperation are fragile at best, and is expendable when it no longer services self-interest. This more purely-construed form of self interest is also why Smith's view of government breaks down. He wants government to get out of the way so that human nature can blossom, though he most certainly opposes all efforts to capture the government to promote the advantage of one group over another. That is a laudable ideal for sure, but Smith's idealism could use a serious dose of realism about how much self-interest can and does take over the reigns of power and use them to promote self-interest that results in winners and losers. As a final point, Smith celebrates human reason as responsible for all of the good that comes from his economic theory. Animals, he says, don't exchange bones. Every man he says is a merchant. Yes, true superficially, but the desire for bones, as a metaphor for self-interest, is the same for humans as dogs. We just add self-interested reason on top of that desire. Just as with dogs, it all depends on inner character and temperament. Sometimes, many times, that reason serves a self-interest that comes at the expense of others if that can be done without consequence via dominance, manipulation, and deceit. A very challenging but rewarding read. I did start it before but found this edition much easier to stick with. I read a lot about economic history already but the genius of Adam Smith is his passive explications of every day trade in its influencing conditions. The book can be numbingly in-depth, porridge for the mind but there in lies its goodness, its intellectual nourishment. So many economics books are just reactions to the zietgeist of the times in which they're published but Smiths work is A very challenging but rewarding read. I did start it before but found this edition much easier to stick with. I read a lot about economic history already but the genius of Adam Smith is his passive explications of every day trade in its influencing conditions. The book can be numbingly in-depth, porridge for the mind but there in lies its goodness, its intellectual nourishment. So many economics books are just reactions to the zietgeist of the times in which they're published but Smiths work is unsentimental and unsparing in its dissection of the factors which inspire and retard trade. The conclusions arrived at by meticulous examination read like eternal truths. The only downside to this work is having to fixate on the different measurement conventions of the late 18th century. However that effort sharpens the mind so sections that in modern prose could have been passively rushed through end up being more thoroughly understood from having to be reread. This is not a joyous entertainment but if you suspect that life is an everyday trade then it is an essential read that can only enrich your understanding. The Wealth of Nations almost sparked a revolution in its time 1776. Adam Smith is considered the father of modern economics. I read this book for researching economics which started merely as an art, and is now a cryptic science ,the very foundation of "business". Book is artfully written. it is a weaving of words to cast a spell . This book was supposed to be an intellectual attempt to appeal people's sense of morality , communal harmony etc to get the to move from self sufficiency (of growing their own food) to mass production environments. One of several attempts made by various prominent public figures to re engineer society. The most interesting thing for me was how much of what Adam Smith said just seemed like common sense. Of course, that is only the case because of Admin Smith! This work is really the canonical text on how the economy works and has defined what common sense (in the realm of economics) has become. As I started to read the ~85 "Analytical Introduction", I realised that it was actually analysing what was to come, so I think it is better to read the main books first and then come back to the introduct The most interesting thing for me was how much of what Adam Smith said just seemed like common sense. Of course, that is only the case because of Admin Smith! This work is really the canonical text on how the economy works and has defined what common sense (in the realm of economics) has become. As I started to read the ~85 "Analytical Introduction", I realised that it was actually analysing what was to come, so I think it is better to read the main books first and then come back to the introduction. It's a dull book – not a criticisms of its ideas, what it's led to, or anything like that, but to read it today, without a direct interest, is tedious. Good start, nice bit about banking in book 2, some interesting history in book 3, but overall it's longwinded. Areas where it comes to point in a succinct manner are the exception and the style is nothing remarkable. Now coming to some of the information regarding economics I have gained from this book. Ah.. its quite a bit difficult to start. There was so much in this book that I don't know where to begin from. So, the first three books of Wealth of Nations deal about the division of labor and how it has reduced the pressure, simplified life and has enabled man to produce more goods in the same period of time with the same amount of workforce. Division of labor has indeed simplified life a human in a society. Firstly, there is lesser work pressure on a single person which gives him the opportunity to improve on his skills. Secondly when there was no division of labor like in the case of single weaver, spinner or the tailor, there was wastage of time and there was lesser productivity. Now, coming to why states where there are more people into primary activities are still developing and states where more people are into secondary and tertiary activities are developed. Well, its because in agriculture, the same farmer ploughs the field, harrows it and does all the work on it. But lets take for example in garment industry, there is division of labour where there is a weaver, a spinner, a tailor and more divisions. There is more productivity and more revenue is generated. Although, this view might be wrong in some cases, but it fits with most. Now, how does division of labour increases the efficiency. A single nail maker can produce maximum, thousand nails in a day. But ten nail makers when they divide the work can produce four Pounds of nails in a day. A Pound is equivalent to 12000 nails. Hence total production would be 48000 nails. Per person efficiency would calculate to 48000 divided by 10, which is equals to 4800 nails per person. There are three main parts which make up the total selling price of an item. They are: the profit, the rent and the wages of the labour. Now, the real cost that is, the price at which an item is prepared is known as its Natural price. The price at which an item is sold is known as its Actual or Market price. The market price depends on competition in the market. If there is more need of products in the market than the products, then automatically, the market price would be higher than the natural price. If there is lesser need of products in the market than the products, then automatically, the market price would go below the natural price of the commodity. But if the supply and demand are at level, then market price would be equal to the natural price. But in either of the last two situations, the businessperson would be a loser in the trade. Only in the first situation would he will make profit. "It is not from the benevolance of brewer, baker or butcher that we expect our dinner but from their regard to their own interest"
Smith says that we address ourselves not to their humanity but to their self-love and never talk to them of our own necessities but of their own advantages. 1) variation of price in the basic materials required to make the finished commodity. 2) good or bad fortune of both his rivals and his customers. Then Smith describes the circulating capital and the fixed capital. The circulating capital of a person is one which he further invests in the trade while the fixed capital is the one which a person buys and is valuable to him but he doesn't sells it or doesn't further trade it. The gross rent is the rent given by farmer to the landlord and the net rent is the profit that the landlord has really gained after giving all the maintenance and wear and tear of the property. Good introduction to thinking about The Wealth of Nations. By the way, I love the Baroque keyboarding that separates chapters, very 1980's. It was a tough read but I finished it. First and foremost, the book is extremely accessible and simple to read. By this I do not mean that to understand what the author preaches one just has to read it all the way, like the average fantasy story; some questions, if not all, deserve and require the reader to think for himself so that he can form a correct picture of the dynamics of Smith's economics as a whole, and not just "listen" to his arguments. What I mean is that Adam Smith is extremely systematic and organized when exposing his arguments, which build up, one by one, into his theory, so that even with no background in economics or political economy, one can grasp it reasonably well. Second of all, this book is not approached from a purely economical perspective, but is obviously injected with a good dose of philosophy, particularly regarding human morals, ethics and behavior. Adam Smith's arguments for his economical system rest on the moral pronouncements which he develops in his "Theory of Moral Sentiments" - it rests on such bases as "humans want social acceptance", and also "human action is mainly guided by self-interest". Any person who has came into contact with humans will have no trouble accepting most of these arguments. That being said, Adam Smith has been shown to be not only a brilliant analyst, but also a very moral person, desiring equality in society, but also recognizing some of the limitations of the capitalist system. Ouvrage économique du milieu du 18eme d'un professeur de philosophie écossais. Il développe les idées de division du travail et d'utilisation du capital pour stimuler la prospérité de tous, tout en étant conscient des inégalités que ça entraine. C'est écrit avec vigueur : Smith ne cache pas son mépris à l'égard de la noblesse, qui va céder inexorablement le pas à la bourgeoisie. Je trouve le sujet parfois aride, voir déprimant, mais l'auteur parviens à éclaircir son propos en étant très didactiq Ouvrage économique du milieu du 18eme d'un professeur de philosophie écossais. Il développe les idées de division du travail et d'utilisation du capital pour stimuler la prospérité de tous, tout en étant conscient des inégalités que ça entraine. C'est écrit avec vigueur : Smith ne cache pas son mépris à l'égard de la noblesse, qui va céder inexorablement le pas à la bourgeoisie. Je trouve le sujet parfois aride, voir déprimant, mais l'auteur parviens à éclaircir son propos en étant très didactique, et nous permet de prendre un peu de hauteur. I enjoy reading books from many of our countries founders. Adam Smith is essential to America's History. I enjoyed the first part of the book the most as it discussed the origins of money. I also like the fact that Adam Smith gives several examples. There are many notable quotes within the book. "The things which have the greatest value in use have frequently little or no value in exchange." "A person who can acquire no property, can have no other interest but to eat as much, and to labor as lit I enjoy reading books from many of our countries founders. Adam Smith is essential to America's History. I enjoyed the first part of the book the most as it discussed the origins of money. I also like the fact that Adam Smith gives several examples. There are many notable quotes within the book. "The things which have the greatest value in use have frequently little or no value in exchange." "A person who can acquire no property, can have no other interest but to eat as much, and to labor as little as possible." "Every man...is much more deeply interested in whatever immediately concern himself, than in what concerns any other man." It's a classic.. I like classics. It's the seminal capitalist work.. and I'm a capitalist. .. but I still didn't like it. I've read so many works on finance and economics that I found all of it very dry and the explanations labourious. I just couldn't transport myself back in time to appreciate that he was likely introducing many ideas for the first time. The (100pg) introduction was interesting and highlighted that Adam Smith's real contribution was his focus on division of labour. This is such It's a classic.. I like classics. It's the seminal capitalist work.. and I'm a capitalist. The (100pg) introduction was interesting and highlighted that Adam Smith's real contribution was his focus on division of labour. This is such a fundamental truth to me in 2014 that I didn't find it as inspiring as I should have. I thought the most interesting segment was book three when he was walking through how different nations saw their regional commerce systems evolve. It was new information, plainly stated, insightful and had me hoping for more! Prior to this study, most Nation's wealth was a crude measure of gold/silver bullion held by the state; Smith, however, described the wealth of a nation as the totality of production by the citizens and industries of the state. While this publication is essential to the development of neoclassical economics, most of its ardent fans tend to cherry pick the elements that support their particular version of "the way the world should be." Fortunately, Smith was more complex than most people recogniz Prior to this study, most Nation's wealth was a crude measure of gold/silver bullion held by the state; Smith, however, described the wealth of a nation as the totality of production by the citizens and industries of the state. I really like Smith's book because it is a much easier economy read to follow. It reads better than say keyne's general theory of money and employment, and contains an evaluation of history through economics. I don't find anything I disagree with Smith on, because I don't contain enough info on economics to critique him, but I've heard that some concepts of classical theory have been refuted by modern economists like Keynes. Again, don't know the exact differences from classical than the modern, I really like Smith's book because it is a much easier economy read to follow. It reads better than say keyne's general theory of money and employment, and contains an evaluation of history through economics. I don't find anything I disagree with Smith on, because I don't contain enough info on economics to critique him, but I've heard that some concepts of classical theory have been refuted by modern economists like Keynes. Again, don't know the exact differences from classical than the modern, but I wish. These books need to be read by people concerned about the economic paths society is taken. Smith, when read, is being abused by current economic ideologues, who cite him as a model while ignoring all the issues Smith was strongly against or for that do not suite free-market ideology. Smith would be appalled at current monetary policy, and believed that unions were the only way that labour had a chance in the labour market. While both volumes exceed 1,000 pages, certainly making it my most voluminous read prior to attending Cambridge, Adam Smith's ideologies and views shaped by his exploration/analysis/musings on the intersections of human psychology, philosophy, and economics,and in particular his views regarding self-interest vs. selflessness -- in my view -- form the cornerstone of his thought-leadership, and what I could personally relate to the most. I read this once in high school and remembered thinking that it was the most boring thing ever. Recently a presentation I saw on the book sparked my interest in it again. I picked it up expecting to only read a bit of it, but reference it a lot. What I realized is that it's a really good philosophy book that happens to explain economic theory. I wanted to read it as it is a classic but the problem i have is it is not relevant to our future. the world is changing and we need another format ! So for reference to why we go boom and bust and thrive on gluttony then yes its the basis of all that is wrong with out bankrupt morally and financially state of nations ! Political economy says as much about individuals as it does about society, and as much about psychology as it does about money (or what money can purchase). Man makes money. Money makes man. Man creates value and man is subject to values. He knows himself by what he is worth. His identity,then, is a stock in trade, and, conditions permitting, a kind of capital he can build upon. This audio CD with its voice characterizations transports you back to the 18th century and analyzes Adam Smith's foundational arguments for a capitalist, free market economy. Much shorter than the lengthy, complex tome it analyzes. Classic economics book from the father of Capitalism. A must read for every free thinker. Wealth of Nations is hard enough to get through without being described by voice actors with very thick accents. Will make no attempt to finish. Although the exact date of Smith's birth is unknown, his baptism was recorded on 16 June 1723 at Kirkcaldy. A Scottish moral philosopher and a pioneer of political economy. One of the key figures of the Scottish Enlightenment, Smith is the author of The Theory of Moral Sentiments and An Inquiry into the Nature and Causes of the Wealth of Nations. The latter, usually abbreviated as The Wealth of Nat Although the exact date of Smith's birth is unknown, his baptism was recorded on 16 June 1723 at Kirkcaldy. A Scottish moral philosopher and a pioneer of political economy. One of the key figures of the Scottish Enlightenment, Smith is the author of The Theory of Moral Sentiments and An Inquiry into the Nature and Causes of the Wealth of Nations. The latter, usually abbreviated as The Wealth of Nations, is considered his magnum opus and the first modern work of economics. Adam Smith is widely cited as the father of modern economics.